Getting your tree’s soil tested now can keep it healthy for the fall and winter seasons. Urban areas such as the DC/Baltimore area present unique challenges to tree health. Some of the stresses trees face in this area include compacted soil, competition with turf for scarce nutrients, and restricted root zones. For commercial properties with trees, the increased foot traffic and higher density of buildings provide even greater stress. To prepare your trees to survive the autumn and winter, you ought to have your soil tested. A soil test can help you choose the right plan of treatment so your trees will stay healthy year-round. Soil mainly contains macronutrients (including nitrogen, phosphorous, sulfur, magnesium, calcium, and potassium) as well as micronutrients like iron and zinc. While the nutrients are essential for tree growth, they may not be present at the proper levels to encourage it. Soil pH levels and texture levels can also help or hinder the tree growth process. What’s more, soil tested on one piece of property may have different characteristics than soil tested in a different area of the same property! 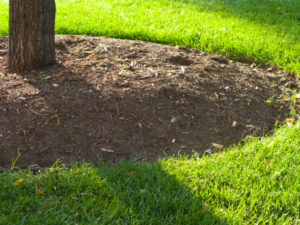 Fertilizing your trees without a soil test is a waste of time, effort, and money. You may not see any results after application. Not only that, the fertilization may actually hurt the soil and plants within the landscape. A soil test can determine exactly what your soil and trees need, and can lead to better fertilization planning. Not only will this benefit your immediate environment, but you won’t be wasting time and money with the misapplication of fertilizers that don’t treat the problem. Having the soil test done in the autumn is a good move. Two vital areas of tree health can be addressed at the same time. Trees don’t grow foliage during the autumn or winter, so nutrients added are used for root development, strengthening the tree. Secondly, any excess nutrients can be stored by the tree and used during the following Spring growth. This entry was posted on Wednesday, September 14th, 2016 at 3:32 pm. Both comments and pings are currently closed.